D Brown Building Contractors Ltd, of Moulton Seas End, are thrilled to announce that two apprentices have joined the company. The former University Academy Holbeach students started their apprenticeships in early July and are looking forward to the career that lies ahead of them. Jordan Smith (16), from Spalding, is on a carpentry course, while Dominic Ford (16), from Holbeach, is getting stuck in to a bricklaying course. Jordan said: “I’m really excited to be working for a well known company like D Brown. Everyone here is really supportive and I’m learning more and more every day. As part of their apprenticeship, Jordan and Dominic will be shadowing one of the site workers at D Browns and will be taking part in small tasks which will help them to learn the vital skills they need. They will also complete tasks which have been set as part of the apprenticeship course, aided by the Construction Industry Training Board (CITB), who will be supporting the company throughout. Lee Driver from CITB said: “The apprenticeship runs for two years, but another year can be added for the students to carry out an advanced apprenticeship at Level 3. It is hoped that the apprenticeship programme will lead to permanent rolls within the company for both Jordan and Dominic in a few years. Des Ford, managing director of D Brown, said: “We decided to bring apprentices on board as we are keen to encourage young people to be able to progress within the construction industry. 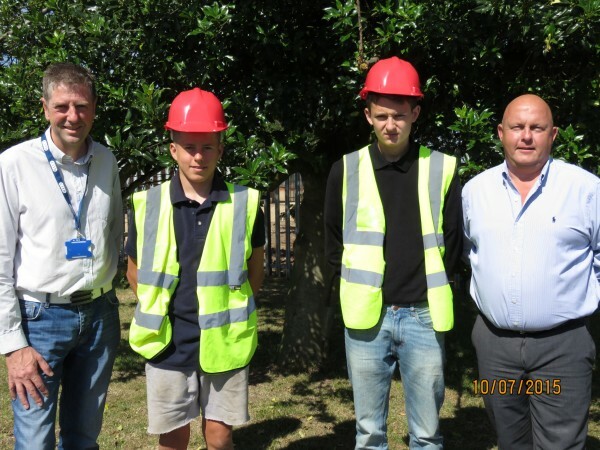 Pictured from left to right: Lee Driver from CITB, Dominic Ford, Jordan Smith and D Brown managing director Des Ford.